Increase accuracy and efficiency when it comes to printing labels in JD Edwards with Print Suite Bridge, our enterprise labeling solution. Our customers wanted an easier way to get more data to their labels without workflow modifications and then have the ability to print directly from JD Edwards. Meet Print Suite Bridge, our enterprise labeling solution. Not only does Print Suite Bridge automate basic label printing, but it is the perfect solution for meeting all of the growing industry labeling requirements. How does Print Suite Bridge work? First, you start by designing the label. Print Suite Bridge responds to the label requests using executables. These can be drop files or tables from JDE or RF-SMART. Once an executable is started, the pre-print processing can collect data from multiple systems, including a machine or web database. You also have the ability to add more fields and additional, potentially complex data to labels. After the pre-print processing, labels are sent to the appropriate printer. In post-printing processing, you are able to log print requests to another data source. You can also print confirmations and error handling, and receive feedback on job and printer statuses in real-time. How does Print Suite Bridge solve your business needs? Industry-standard labeling elements at your fingertips. 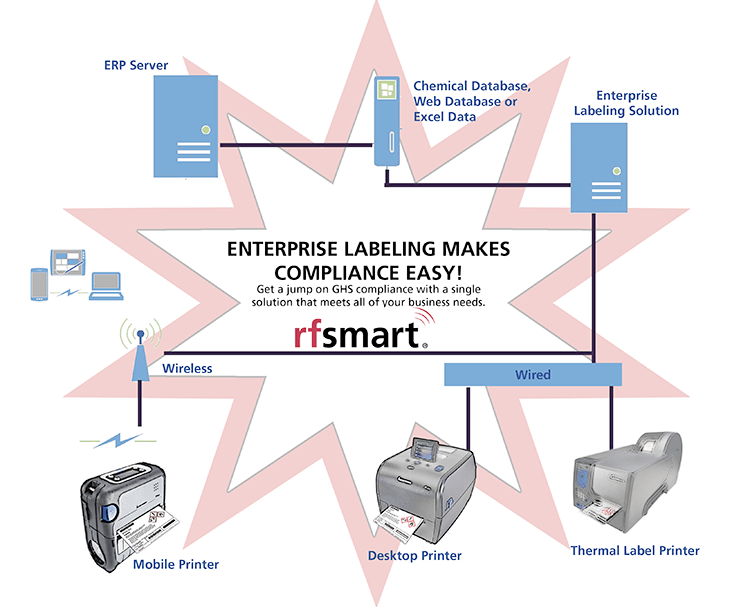 Print Suite Bridge can pull symbols, signal words, and hazard elements from a centralized database and any additional label requirements (like lot and serial numbers, expiration dates and other data) from JDE - ensuring that your compliance labels contain essential, approved messages to increase efficiency. Flexible and scalable. Connect all of your printers to your applications. Print Suite Bridge can even connect to specific printers based on user, transaction, warehouse location or other JDE fields. Increase efficiency. The easy-to-use label designer allows you to choose fonts and place symbols, barcodes, and images where you want them for quick, easy customization in minutes - instead of weeks! Reduce errors and gain quick return on investment. Automate your labeling process - a simplified print interface reduces reprints, eliminates the risk of human error and saves material costs. GHS, a global standard for labels containing hazardous materials, went into effect June 2015. To meet the GHS label requirements, you’ll need to pull data from different systems - JD Edwards, SDS database, even excel - in order to capture all of the chemical product statements and pictograms, as well as your product and supplier information. That can quickly lead to redundant data sources and wasted money on manual processes. With Print Suite Bridge, you can work from a single source of truth for creating and printing your labels, bringing all of your databases together in one place. This level of integration enables dynamic labeling and ensures accuracy and efficiency. Are you ready to experience increased accuracy and efficiency in your warehouse?